Futures Magazine is a monthly magazine about the futures markets. Since futures contracts are also traded on broad stock indexes, there are also articles about the economy and the market in general. An outlook on where a particular futures market will be heading. They cover different financial markets and economies of many different countries. Sometimes they will focus on an individual stock if the article is related to another relevant topic like risk management or something. Articles covering all aspects of the process of trading, including: the mechanics of trading (like entries and exits), tutorials on different investment products (like options), risk management techniques (like stop losses), money management techniques, and market psychology. News related to regulations, the various futures exchanges, commodity fund returns, or important people in the industry. These articles show you how to construct an automated trading system. They tend to be beginner articles with systems that are not too complicated. If you want more complicated coverage of systems trading, then you should read Technical Analysis of Stocks and Commodities. These are reviews of new technology, software programs, brokers, and books for traders. Once a year they publish special reports. One is the "Guide to Computerized Trading." This report is a waste because it is just a yellow pages for software and data vendors and carries no reviews or value-added content. These special annual publications are usually available for free for download from their site anyway. I have been reading Futures Magazine on and off since 1992. The magazine hasn't evolved much in the past 15 years or so. As expected, it does a good job monitoring the futures markets. This is useful since the mainstream business media tends to report on specialized asset classes (like commodities) only after they have made a big move. But Futures Magazine will have more anticipatory articles (e.g. "Is coffee finally bottoming?") which can alert you to trades that you otherwise wouldn't have known about. They tend to be very fair in giving all of the different futures markets equal exposure (grains, metals, softs, energy, currencies, fixed-income, and stock indexes). This is a refreshing change from the mainstream media which seems to think that oil is the only commodity that exists. I also like that the magazine sometimes has articles about markets which are not covered too often, like a foreign stock markets (e.g. Hong Kong or Brazil) or other less closely-watched securities (e.g. Eurodollars or Japanese Government Bonds). These markets tend to get overlooked by an average trader because monitoring these markets most likely won't be part of their day-to-day schedule. The magazine's writers carry a higher level of market intelligence than most other sources. For example, they were ahead of the curve when it came to trumpeting the idea that volatility should be considered a separate asset class. Unlike traditional financial publishers, their articles aren't oversaturated with trite Warren Buffett quotes. I get relentlessly peppered with those little tidbits of wisdom every time I read an investing article in any mainstream financial publication. They may be useful at times but they don't add value from a day-to-day perspective. 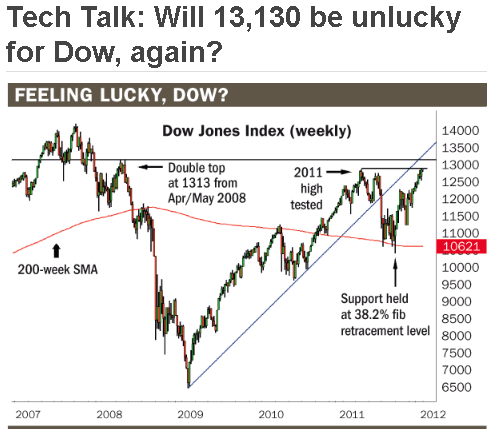 A great example of the intelligence displayed by Futures Magazine was in March 2012 when the Dow Jones was re-approaching the 13,000 level for the first time since the market meltdown. There were literally hundreds of articles published by the financial media (such as the one below) about the importance of the 13,000 level, when, in reality, the 13,000 level was completely meaningless. Futures Magazine, however, wasn't interested in such superficial and meaningless blather. They instead wrote an article about how the Dow would be facing overhead resistance at the 13,100 level from the previous highs in 2008 (as shown in the chart below). Intelligent traders realize that the next "milestone" (as amateur reporters refer to them) is usually the previous turning point on the chart. Even traders who don't believe in technical analysis believe (even in a vague sense) that previous lows and highs are important points. Two months later you can see how the market action played out in the chart below. The market didn't pay any attention to the popular 13,000 level, but it did trade off when immediately after it reached the previous highs that were pointed out in Futures Magazine. I hesitated to post the updated chart below because my point in showing this example wasn't that the article by Futures Magazine was correct. My point was that their article was intelligent. And it was intelligent because it was based on logical analysis - and not based on superficial, populist idiocy. One of the most refreshing aspects of Futures magazine is that the writing completely comes from a trader's perspective, which is to say they have more forward-looking content as opposed to simply reporting things that already happened. Traders don't care what happened last week. An example would be this quote from an article about the impending real estate crash from an article called "The Big Bad house" published in October 2006. "By any traditional valuation, housing prices at the end of 2005 were 30% to 50% too high. … The national median price of housing will probably fall close to 30% in the next three years. … Right now the stock market seems interested in the problem but remarkably unresponsive." This one article carries more value to me as a trader than all the aggregate content written by everyone about the real estate market after the crash. From an analytical standpoint, their articles incorporate a blend of technical and fundamental analysis, which is what I use. And many times, they also take a long-term view (20 years or more), which is not too common. There are two particular regular columns that I find useful. One is the "Hot Commodities" page, which gives a summary of certain markets which deserve to be in the spotlight for whatever reason. The other is the "Trader Profile" column on the last page of the magazine. It carries a biography of a different trader every month and is inspirational for up-and-coming traders. The magazine's content tends to be directed to traders about 80% of the time and then industry players about 20% of the time. Hence, there are articles about the futures industry that don't directly affect a trader (i.e. the fall of Refco, recent news about the CFTC, etc.) and can be skipped over. Overall, the magazine tends to lean towards beginning traders, which gets annoying sometimes. If you read the magazine for a couple of years then you'll see more and more of the same type of articles (like "Optimizing vs. curve fitting" or "All about naked options"). If you are a futures trader then I would definitely recommend you sign up for the magazine due to the high relevancy of the content regarding market outlooks and trading strategies. If you are only a stock trader then the commodities markets will only affect you to a limited extent (cattle prices will affect the stock prices of steakhouses, etc.) so you won't need the market outlooks. But the articles on trading strategies apply to all traders and the articles about options may apply also. So, in that regard, it is a coin flip as to whether or not you need a subscription. But the good thing is that you can sometimes get a free subscription if you meet certain criteria.